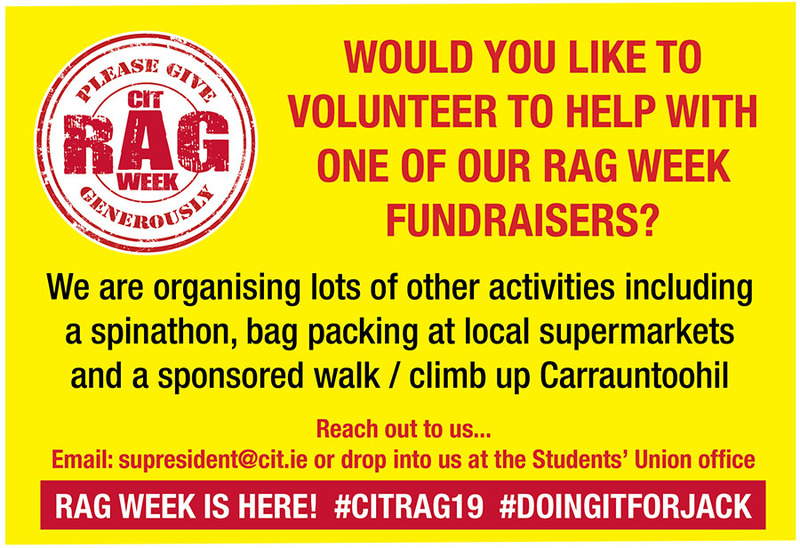 MyCIT.ie - RAG Week fundraising... we need volunteers! CIT Students' Union have a variety of different activities planned in the forthcoming weeks and months but these will not be possible unless we get student volunteers to help us in our fundraising for a most worthwhile cause. If people can volunteer, can they please email: supresident@cit.ie indicating which event they might be willing to put themselves forward for and which times they are available to help out at? This charity really needs all our help so urging all of you to please get involved! Tuesday 5th February - You can volunteer to get legs, back, chest etc waxed or else you can volunteer to get your head shaved, all for a brilliant cause! Thank you all so much for your ongoing support. Looking forward to seeing the very best of CIT on show over these coming months.